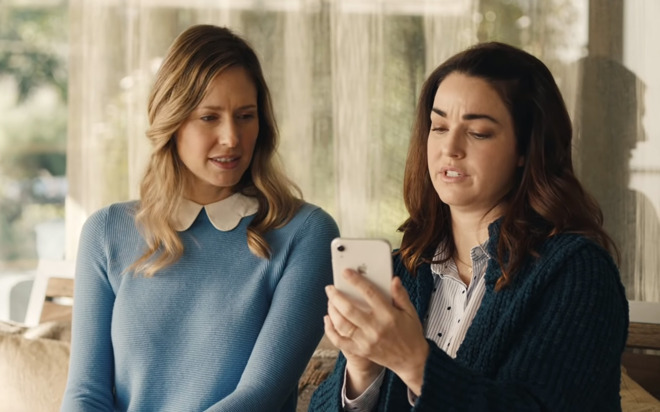 The spot features a trio of mothers talking while their kids are out playing. One of them shares a photo of her son, only to be met with indignation at another child being blurred out by Depth Control. The first woman shows that the child can be "unbokeh'd" at will. The first ad debuted earlier this month, and featured someone using Depth Control to blot out the realities of New York City. The current generation of iPhones marks the first time Portrait Mode has been available on models below the most expensive options. The XR is moreover the first single-lens iPhone to offer it, using algorithms alone to calculate depth. While the mode has been around since 2016, it was previously restricted to dual-lens cameras. In that case a telephoto lens captures the subject while a wide-angle lens snaps the broader scene, using that as a reference point. I want to Bokeh her in the face with my fist. What a GD entitled sneauxflake! Right! I love the “I’m just saying at the end and look on the other mom’s face. Disable Depth Control buy default. Apple is inadvertently opening up a slippery-slope with this Bo-keh Ad. It shows that 'Apple Owners' are inept at operating their iPhone Camera... by admitting to making mistakes, and producing unintended negative-results. Subtle, but scary all at once. Apple devices are accessible by Billions of people. Obviously some users are going to make mistakes. Would you say the same for Android & Windows users? How is the “Apple Owner” inept at operating her iPhone camera? She demonstrates complete mastery of the depth control feature lol. And scary? How so? Did we watch the same spot? btw, that was no mistake, she obviously bokeh-ed Jacob on purpose, even though she assures her friend, somewhat unconvincingly, that it was completely unintentional. So, what do you think about when you take a picture of your child? Who’s the most important subject of a shot when you just want to snap a pic of your kid? Ah. Yours. Pretty normal, isn’t it? Unless of course you intend to take a photo of your kids together with friends. The fact that Jacob’s mother draws the conclusions about intention and hate is IMO a superb allegory about today’s society. Like gender discussions etc. : the fact that I don’t explicitly put you in the foreground doesn’t automatically imply I dispose you/don’t respect you etc. But that’s today’s heresy. Any idiot can claim discrimination while it simply all starts in your head. Both, the fact that she states this accusations tells more about herself - as usually people draw co cousin a based on their own behavioral patterns - in other words: it’s what she would do and therefore it must be the same when she observes something like this with somebody else. Secondly, if you search for discrimination you’re likely gonna g to find evidence anywhere. I’m pretty sure the woman who took the pic didn’t want that kid in the picture. And after that exchange, she promptly cropped the photo to remove him completely and deleted the other woman from her contacts and posted to social media what a complete selfish b*tch she was. At least, that’s what I’m going with. Seriously, I feel like I am reading comments posted by aspies. The ad is supposed to be a joke. I know I would make a joke about "how dare you bokeh me out" or whatever. The participation trophy culture, come home to roost. You're taking this funny commercial as if it is something from BBC! It actually makes you into one of "them" sensitive person that does not get a joke and is easily offended. Don't you see it?? Don't become them! Huh?! What the hell is wrong with some of you?! Scary??!! HUH?! A simple funny-as-hell commercial somehow led to two facepalming posts that just defies common sense. Ah, this. I get your point as well, and maybe you’re right: that day I just had to deal with one too many of such persons so probably I had enough sure the ad is meant in a humorous way. Just commercials are a very good mirror of society: from the topics and motives you can very well understand this. And this kind of behavior as depicted unfortunately can be encountered too many times, and my points valid - though probably a bit over the top on the context of the article. Are you people serious. What is going on in there. Seek help. Indeed, it’s the ultimate irony — those wallowing about snowflakes are themselves precious snowflakes. And vocal.